The transfer of Lee Hall’s stage adaptation of the 1976 film Network, first seen at London’s National Theatre last year, should fit right in on Broadway, where at least ten current titles (more than a quarter of the total playing) are stage versions of films. These range from long-runners such as The Lion King to more recent arrivals such as Frozen, Pretty Woman, Mean Girls and King Kong, with Clueless (about to open Off-Broadway), Beetlejuice and Tootsie on the imminent horizon. But Network is altogether bolder and more uneasy than any of these. It follows a news anchor, Howard Beale, who ‘loses’ it and threatens suicide live on air, only to see it turn into a rallying point with which to channel a populist rage. 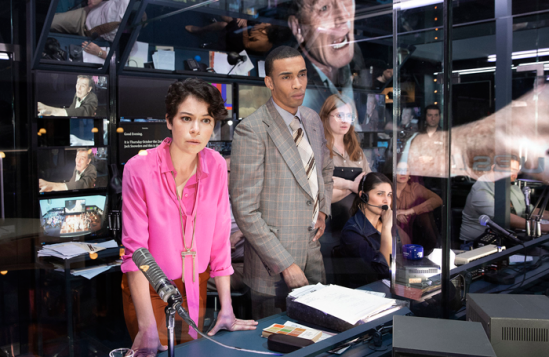 It startlingly implicates and appropriates its theatre audience as a kind of live studio audience. 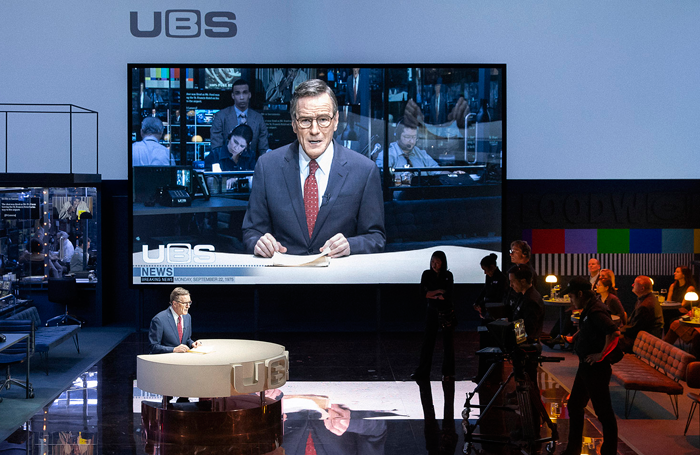 Form and content are merged to precisely mirror and amplify each other in this terrifyingly prescient story of media manipulation and the relentless chase for ratings, above all, by a fictionalised television news network. 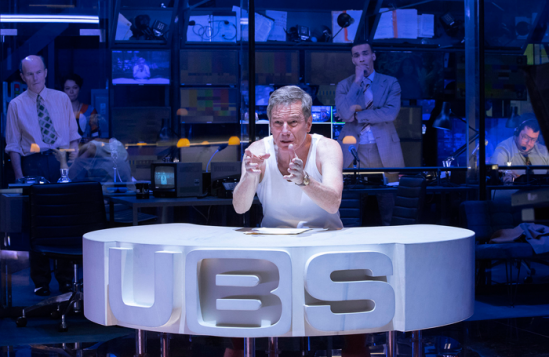 The absolute genius of Ivo van Hove’s production is to give this a churning, gripping immediacy, as TV cameras swoop over the action and relay images to a giant screen centre stage and on smaller screens throughout the auditorium. 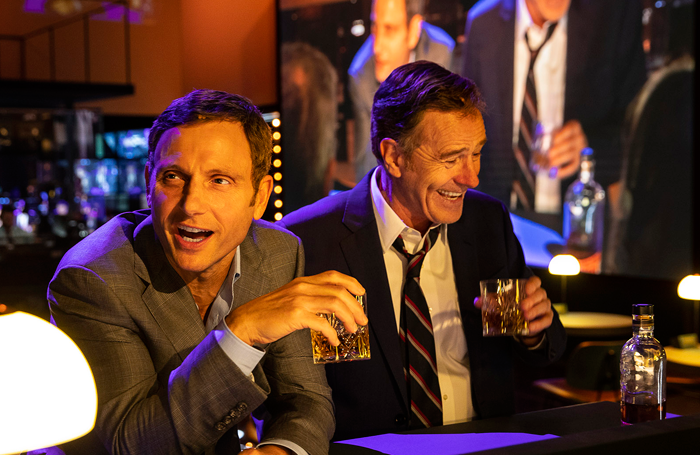 And it is propelled by a searing, shatteringly committed performance from Bryan Cranston, for which he won him an Olivier and Critics’ Circle Award in London, bringing the intense, intimate detail of his TV work on Breaking Bad to fill a much bigger canvas. That stage is slightly smaller than it was in London – the stage left bar only serves food and drinks to around seven small tables – but the impact is even more shattering. 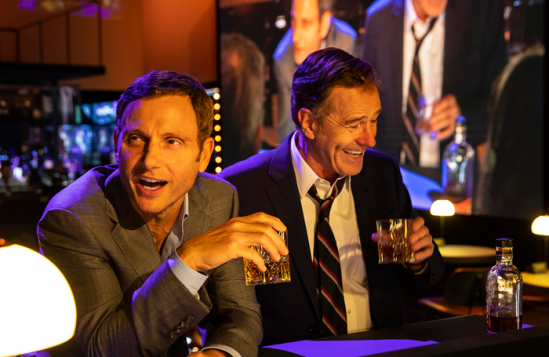 Cranston is joined by North American actors, including a tensely terrific Tony Goldwyn as his best friend and boss Max, who has to fire and then re-hire him, Tatiana Maslany as the channel marketeer chasing ratings at any cost, and Ron Canada as the network chairman. In an America ruled by fake news, the honesty of this show could become a beacon and rallying point for change.